Over at Julie's: Life with the Pollinators. I've always loved having my rose garden and flowering plants because they are so beautiful and fragrant. Our garden, orchard and herbs provide us with fresh, vitamin rich fruits, veggies and seasonings. Since the Bees came to live with us I am looking at everything quite differently now! Will and I have officially been "Beekeepers" for 11 whole days! We are responsible for providing a safe, chemical-free environment for the most amazing insects! We are also responsible for providing fresh, clean water, pollen and nectar 365 days of the year. That's huge! You know when you're in the market to buy a car and you finally decide what make and model you are getting and all of a sudden you see that vehicle everywhere you turn? Well, it's kinda like that with having bees, but different! 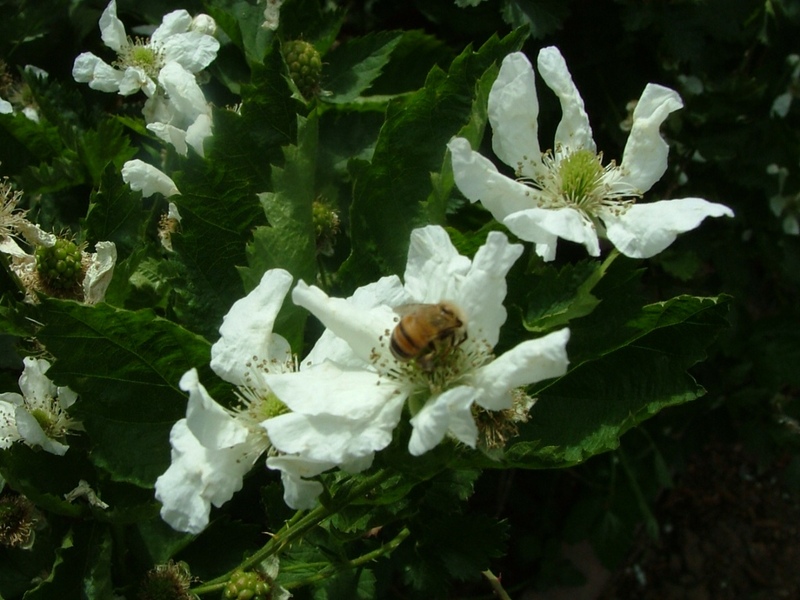 Once I decided I wanted bees, I noticed them everywhere foraging in my garden. I'd look for them a Lowes to see what kinds of plants they preferred. I find myself scanning my yard and my neighbors' looking for potential chemical-free sources of nectar and pollen. My neighbor south of us has 3 palo verde trees in bloom right now. My neighbor west of us has berry bushes, 2 Chinaberry trees, and palo verde in bloom. I want to provide food sources close to home so our little Pollinators don't have to forage in the farmers' fields ladden with insecticides and GMO plants. A little Pollinator in our delicate blackberry blossoms. 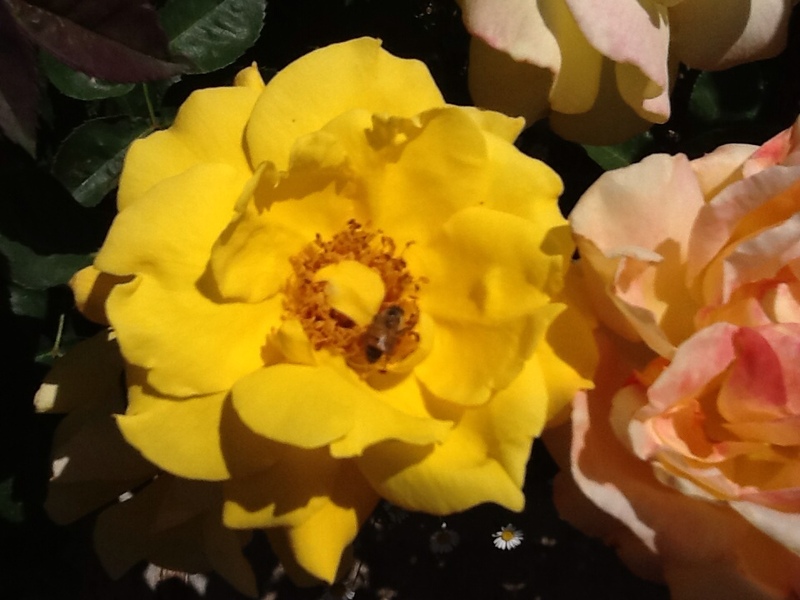 Little Pollinator in Midas Touch and Whiskey Mac rose blossoms. 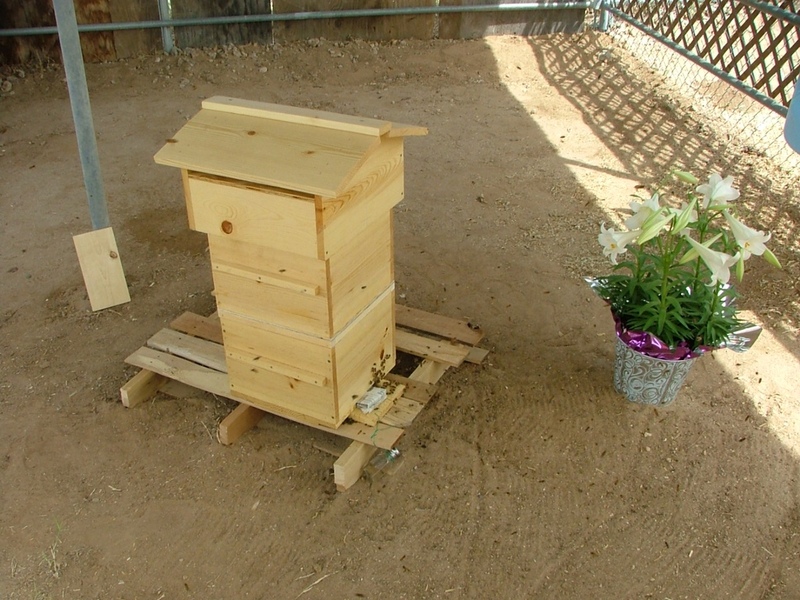 Warre' Hive, home for our Pollinators. Notice their very own Easter Lily. Our Bees take their foraging very seriously. For a hive to grow and prosper there needs to be pollen from many different plant sources to provide the different vitamins, minerals, proteins and sugars necessary for a balanced bee diet for the thousands of larva in the brood hive. One food source is not healthy for us or for the bees. Little known fact: The more a blossom is pollinated the tastier and sweeter the fruit or vegetable and the more fruit and veggies you will get. A squash blossom must be visited by a pollinator at least 7 times for it to set its fruit. Installing the first few bricks. I've been working on a project this week to provide more flowering bushes and plants throughout the summer. Pulling out Bermuda grass and putting up a wall to keep in our water when we irrigate. 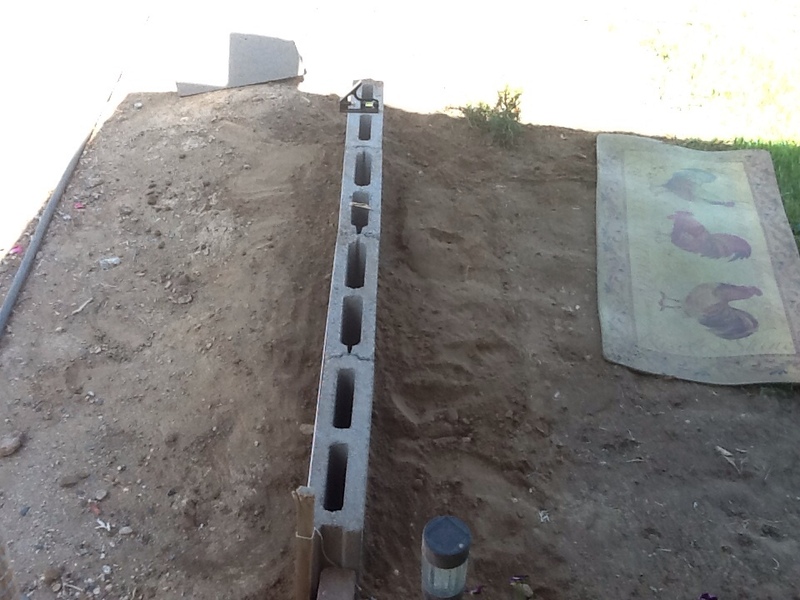 So far I have the back wall completed, most of the Bermuda out 2 flowering rosemary plants and a blue plumbago planted. I'm planning on adding gloriosa daisies, and different types of sunflowers to provide a good food source throughout our brutal summers here in Arizona. I still have more Bermuda to pull out and the front landscaping bricks to put in, but it's shaping up nicely. 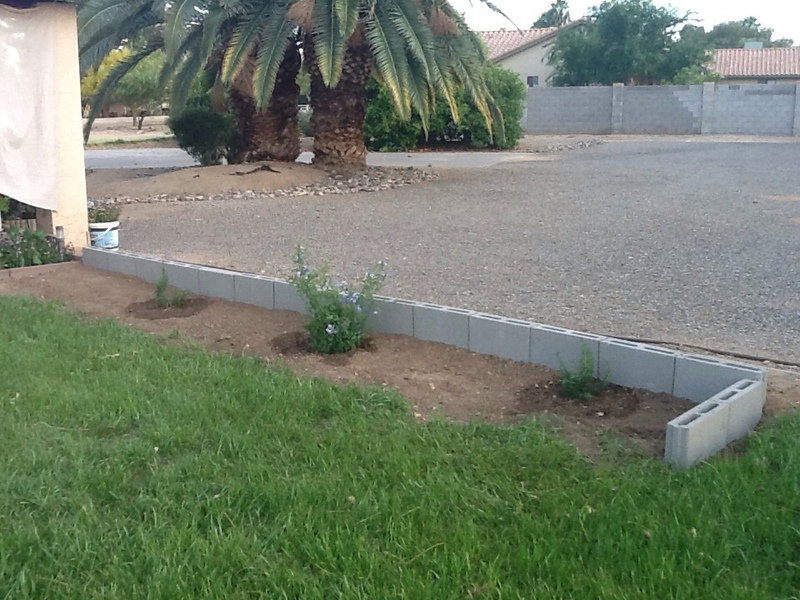 Back wall completed, rosemary and blue plumbago planted. We're in high gear right now. Our potato bushes need to be hilled so potatoes can form. Will is working on a new Warre' Hive with observation windows. We will see our first triple digit weather tomorrow, 103 degrees F. = 39.4 C. = Can you say HOT!!! Today we ate the last of our spring peas. I've planted yellow wax beans in their place . . . Will's favorite! Would love to hear from you dear friend . . . what's keeping you busy? Are you putting a garden this year? It's heating up . . . Over at Julie's!!! I agree, Annette, once roses are established, a good deep soaking once a week, some of stinky Alaskan Fish Food every couple months, and they do great in Arizona! Thanks so much for your comment! It's great to know a fellow-Arizonan is reading my blog!